It’s no surprise, that one of 2008’s best releases in hip hop comes out of France, since the country of special treat provides the world with dope sounds for more than two decades, now. Clin D’Oeil was crafted by DJ Damage, Dusty, and Madhi – together Jazz Liberatorz. Their music is a tribute to the golden age of hip hop, taking its strength into the roots of the black music and more notably in jazz music. Through out the album, listeners discover the warmful sound of the old jazz fusion records from the 70’s mixed with samples and live instruments on which Jazz Liberatorz have invited la creme de la creme of the independant hip hop, soul, & jazz scene such as Sadat X (Brand Nubian), Tre Hardson & Fat Lip (both formerly of The Pharcyde), the self proclaimed Hippie of Hip hop Asheru (Unspoken Heard), J.Rawls & J.Sands (Lone Catalysts, 3582, Liquid Chrystal Project), Buckshot (Black Moon, Boot Camp Clik), Sol Uprising’s Stacy Epps, Apani B Fly, and many more. The recently released box set is limited to 500 copies and only available in selected record stores around the world. It includes six 12”-vinyls with all tracks of the Clin D’Oeil album with instrumentals and previously unreleased tracks on each one of them. 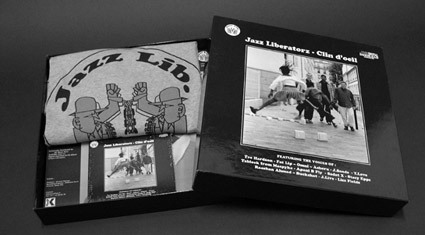 The album itself is also included on a digipack as well as a limited Jazz Liberatorz Shirt, provided by Carhartt. During the last years Kif Records has brought us musical gems from artists like Birdy Nam Nam, Trankilou, Trouble Men, and many more. Pepe Bradock’s all time classic Burning is also a Kif release. The label is run by three times French DJ Champion Faster Jay, also known as member of famous French hip hop group Alliance Ethnik.